What's the best way to try VR on the cheap? “Is there any way to check out VR without spending hundreds of dollars or waiting months for hardware to be released?” – Jack B.
You’re in luck, Jack. While it won’t be long before dedicated VR headsets hit the market (the HTC Vive launches in April for $800), if you’ve got a new smartphone there’s a cheap and easy backdoor into the world of VR that will give you the taste of tomorrow you’re looking for. Thanks to Google’s Cardboard VR project, a cottage industry has sprouted around housing smartphones in clever, inexpensive enclosures designed to mimic high-end VR headsets. A good basic pick for the price is View-Master’s Virtual Reality Viewer. This well-crafted, plastic and soft rubber cradle skips the disposable, fold-your-own ethos found in most Google VR products and is readily available for less than $30/£20, a worthwhile improvement over paper-based viewers. 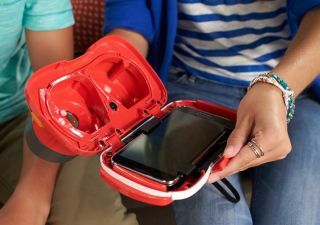 Features include front camera access for augmented reality apps, a slide-switch for interaction with the display, and a design sure to inspire nostalgia in anyone who played with the original View-Master toys as a kid. Viewers with more sophisticated features, such as hands-free operation, aren’t hard to find either. A quick search on Amazon yields a multitude of viewers under $100/£70, with options for almost every phone and budget. The most sophisticated so far is Samsung's Gear VR, which has the benefit of John Carmack's programming wizardry behind it. The advanced displays and mobile processing power available in current generation smartphones produce a beta-style version of VR that’s a lot of fun to explore on its own, but there’s a wider frontier available thanks to apps such as TrinusVR and KinoVR which link these viewers to PCs and retrofit games for VR viewing. These mobile apps work by turning your phone into a remote screen for your PC and processing the image to produce or simulate 3D. While they perform best with software designed for VR use, they also include modes that allow older games to operate with VR-like features. Details like head tracking are handled via mouse emulation or software such as opentrack, which uses phone sensors, or FreeTrack, which uses a webcam. With a bit of personalized tweaking, especially for eye distance, lens correction, and controller sensitivity, you’ll be walking around inside your game. I tested the View-Master VR viewer with a variety of games including Crysis 2 and Elite: Dangerous using a Samsung Note 4 on an 802.11ac wireless network. Setup took less than 20 minutes; both TrinusVR and KinoVR provide step-by-step instructions in case problems arise. Certain games prefer certain VR packages, so check on forums, or try out both with your favorite games if you’re having problems. Switching might be easier than dealing with software conflicts. Keep in mind that while this provides an introductory VR experience, it’s nowhere near the same league as dedicated VR hardware. Top-shelf tech such as the Oculus Rift runs rings around these viewers in terms of visual fidelity, latency, and control accuracy. If you're at all sensitive to VR motion sickness, the lower refresh rate and lack of head tracking might leave you queasy. The same goes for playing games not designed for VR with a headset on. But if you have an iron stomach and are dying for a cheap taste of VR, these can offer you a first step. The DIY nature of Cardboard VR does also means starting up games is a multi-part process, and homebrew-style concerns such as overheating phones are commonplace. Improvements are coming, however. Google is looking at inexpensive, stand-alone versions of VR hardware that don’t require a phone and boast performance and quality improvements across the board. View-Master also has version 2 of its VR viewer coming later this year with a planned price of $40/£28 and improvements such as headphone support and a built-in focus wheel, so stay tuned. Even if you're not interested in a cheap shortcut to experiencing VR, the larger the industry, the sooner headsets like the Rift and Vive become more affordable.